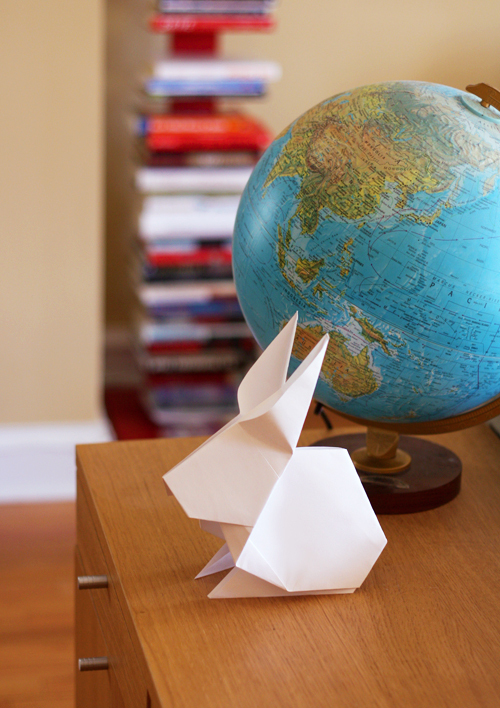 Wouldn't it be fun to have a litter of origami bunnies for your Easter centerpiece? Do big ones, like this guy I made. Or decorate each place setting with a smaller rabbit. Or hide them around the house just for fun. This bunny model is designed by Stephen O'Hanlon and demonstrated by Mari Michaelis in this step-by-step video. Mine is made from an 18" square of sketchbook paper. It's much thicker than origami paper, and thus harder to fold, but the resulting rabbit is quite a sturdy fellow. He's about 9" tall. Then after I folded him, I saw these printable rabbit chocolate bar wrappers at Mini-eco. You could have a thoroughly origami Easter! Great! Yep, I've made those bunny boxes before and they're cute! Here's mine. J'adore, il est trop joli. Merci! Precisely. You will feel happy when you see them. I put a tiny rabbit on my husband's keyboard, and I think he liked it. Being careful of course not to put two of these bunnies too close together in your Easter display...they tend to multiple. Forgetting to put them away after Easter also has them inviting over their dust-related cousins. I just found you through Pinterest and I am already a BIG fan of your design work. I had to check out your portfolio too. Impressive!! Love your logo work!! Katja, thank you! That makes me happy!